November passed quickly with the garden left largely unattended and mostly unvisited, except by the avian community. Most days colorful Eastern Towhees, Northern Cardinals (North Carolina’s state bird) and Eastern Bluebirds vie for turns at the feeders. Occasionally, Red-bellied Woodpeckers stop by and frequently, Brown-headed Nuthatches and Black-capped Chickadees watch for their chances to approach. On November 22 there were ample flowers left in the borders to fill Thanksgiving day vases with fresh zinnias, echinacea, lavender sprigs and foliage, Iceberg roses, chrysanthemums, and there were pristine camellias to float in small ceramic dishes. The next day brought the first hard frost of the year and this week a few nights with temperatures down into the twenties finally have convinced many plants to consider winding things down. I wandered around today to see what has survived the cold. The old-fashioned woody-stemmed pale yellow chrysanthemum looks very sad, but I included a couple of pictures below to illustrate an interesting transition. One image shows the original yellow of the flower and the next shows how the chrysanthemum flowers change to pink as they fade. Most of the garden is wilted and tinged with brown, though a few flowers still look nice for this time of year. As November’s end approaches the day is clear, the sun is low. By 1:30 pm much of the garden lay in shade cast from the Carolina Sapphires. The sunset will come early at 5:02 p.m., after making its late start this morning at 7:06 a.m. November accomplishments are few except for the addition of a few daffodil bulbs, but the garden and the gardener are content. 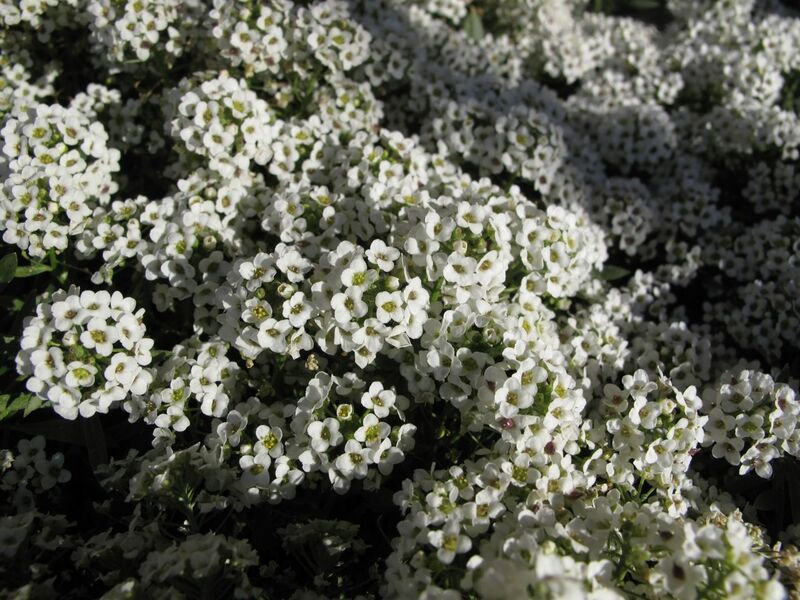 This entry was posted in garden and tagged almanac, august garden, autumn blooms, chrysanthemum, clematis, nature photography, photographing nature, sweet alyssum on November 29, 2012 by pbmgarden. Such an interesting difference between Vermont and North Carolina! Amazing to me that you have so many flowers in November, ones that are long gone by this time in the north. It seems a bit unusual to me that some of these flowers are still blooming too. Thanks for stopping by (I couldn’t get to your site). Your flowers look great compared to here in the Pacific Northwest! That was us 6 weeks ago! Still so much to look at in your garden – wonderful! I love lamb’s ear leaves and have some in my garden too. Some leaves remain through the winter, but mostly they decompose and thus protect the plant from frosts. Our sunrise is about 7:40am, sunset 4:20pm, so we have less light at the moment. Interesting to note the differences in your weather since we do grow a lot of similar plants. Glad November has been enjoyable for gardening. We need some rain here. Lovely to see that you still have so many flowers brightening your garden. We have had some hard frosts this week so now everything has decided to have a rest! Winter is still a lovely season with its contrast to the rest of the year. Thanks Pauline. It will be interesting to see what winter brings. Our last winter was mild and spring came very early. I’m ready for a bit of winter (maybe just a few days will do it! ).